The long, mournful howling in the distance easily distinguishes the wolves' vocalizations from coyotes' high-pitched, yipping howls and dogs' barking. In daylight, however, when there's only a few paw prints to distinguish between the canine species, you may wonder if they're those of a wolf (Canis lupus), large dog (Canis lupus familiaris) or coyote (Canis latrans). Wolf paw prints are distinctly larger than a coyote's. Between 3 and 4 inches wide and 3 1/2 and 4 1/2 inches long, excluding the claws, an adult wolf's paw print is nearly twice the size of a coyote track. 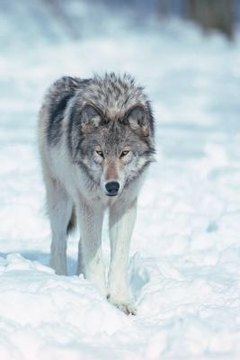 While wolf tracks resemble those of a large dog, most dog breeds have feet smaller than 4 inches long. Careful observation also reveals that dogs tend to wander about, sniffing, while wolves and coyotes generally travel in a straight line. In addition, a wolf's paw prints reveal that the front and hind feet travel in a line, called direct registration. Dogs' front and rear paw prints are generally not aligned. International Wolf Center: Was That a Wolf? What Is the Appearance of a Gray Wolf?